Boil the hot dogs according to package instructions. While cooking, prepare the sauces. For the salsa verde (green sauce): With the help of a food processor, combine 2 tablespoons of mayonnaise, garlic, cilantro and salt, to taste. For the salsa rosada (pink sauce): In a bowl, mix 2 tablespoons of mayonnaise with the tomato sauce. For the pineapple sauce: In a frying pan, cook the pineapple with the brown sugar. For the garnish: Once the hot dogs are fully cooked, serve in hot dog buns adding the slices of bacon (2 slices per dog), pineapple sauce, shredded cheese, potato chips, and finally, the salsa verde and rosada. Try adding chicken or quail eggs to the hot dog. 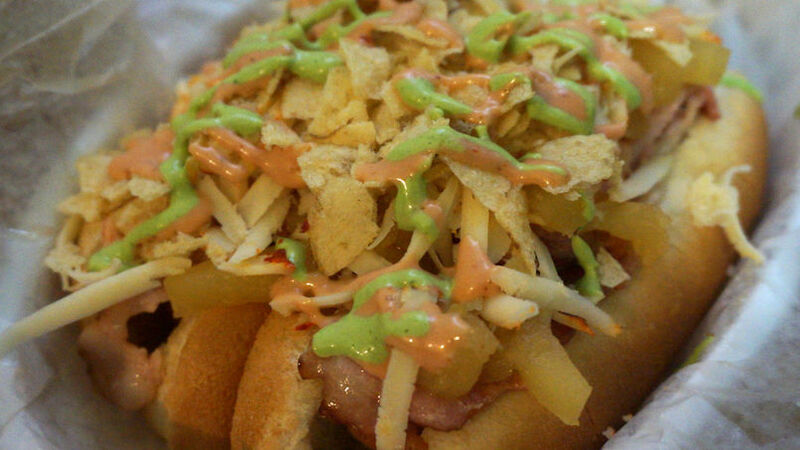 Hot dogs are delicious, especially these traditional Colombian hot dogs. In my country, they’re sold with a variety of toppings that go beyond mustard. There are hot dogs with bacon and chips, some are prepared with two hot dogs, and others even come with an egg. Some of the hot dogs I remember eating most were sold from the garage of a house. I used to eat them with my college friends, they were the best in the city, and these dogs came with all kinds of sauces and even quail eggs.